The biggest impediments to widespread adoption of green construction practices are the cost - either real or imagined - of incorporating more environmentally friendly features into construction projects and a lack of understanding about what can and should be done, according to a survey of attendees at the New York State Green Building Conference. The best way to overcome that problem, most of the respondents said, is widespread education and effective leadership. More than 300 people who attended the conference last month in Syracuse, N.Y., were asked to participate in the survey. About 40 responded, with about half the respondents pointing to the cost as the biggest impediment to more construction of green buildings and about the same number saying a lack of information is the first obstacle to overcome. 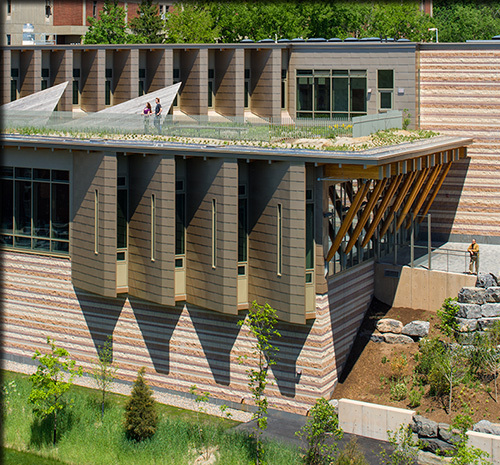 The conference, held for the 12th year, is hosted by the SUNY College of Environmental Science and Forestry of Syracuse, N.Y., in partnership with the U.S. Green Building Council New York Upstate Chapter and the Center of Excellence in Environmental and Energy Systems. The survey responses were reported in connection with ESF's Earth Week celebration. Paul Crovella, an instructor in ESF's Department of Sustainable Construction Management and Engineering who is on the conference advisory council, added to the respondents' thoughts by pointing out that change is a slow process. "The construction industry has been slow to adopt change, and many times with good reason," he said. "The results of a single misstep, like asbestos or lead paint, are with us for decades. However the industry is recognizing that a misstep today may be even more costly to both owners and society at large. Crovella said green building is at the intersection of the long-term impacts created by the traditional construction industry and an urgent need for fundamental change. "Changing minds will bring the support needed," he said. Bob Kaczorowski, a senior mechanical engineer with Watts Architecture & Engineering, summed up the impediments as a "lack of understanding of techniques, perceived high costs and lack of understanding of advantages." He mentioned one solution that was valuable enough to bear repeating: "Educate-educate-educate." Sarah Cottet, the director of environmental health and safety at New York Medical College, described the impediments this way: "Lack of information, particularly on how such (construction) can benefit the institution" and "misinformation regarding expense and obligations, and lack of flexibility." The solution, Cottet suggested, is "outreach to people in executive leadership positions regarding the capacity of green construction to benefit not only humans and the plant, but also the company's bottom line." Other respondents identified the problem as a lack of understanding among the public regarding the challenges posed by climate change, widespread ignorance about the benefits of green building, and resistance to change. Suggested solutions included government-supported incentives and building code changes, funding to help pay for upgrades to mechanical systems and building envelopes instead heating costs, training for contractors and construction workers, creation of product and material reporting standardization and establishment of federal and state standards for CO2 reduction, and political action by interested parties. Sarah Welch, a project executive with Welliver, offered a hopeful note when asked how to overcome the impediments: "Reach the children," she wrote. "Their message will evoke change."